Hi everyone. This is a new listing and a sister home to our existing Collingwood Retreat property (#3717960)! Similar in look and feel, therefore please inquire about both properties. Our calendar is always up to date! Welcome to Charleswood Retreat. Whether you’re visiting Calgary to take in the sights and culture, the Stampede, a family reunion/gathering, and/or using it as a gateway to the Rocky Mountains, Charleswood Retreat is your getaway for 1 guest or up to 8 guests. There is plenty of space for everyone to find some rest and rejuvenation in this recently renovated bungalow that includes 4 bedrooms, 2 full bathrooms, and large living areas for you to kick up your feet and relax. For occasions requiring more than one home, or if this calendar is full, please inquire about our nearby property in the community of Collingwood (listing 3717960). It is located 2 mins away and provides a similar layout and feel as this vacation home. Please go to http://www.homeaway.com or http://www.vrbo.com/ and search for property #3717960. Charleswood Retreat is equipped with a modern kitchen, bathrooms, fixtures, and furniture for your vacation needs. Enjoy the Wi-Fi high speed internet access, large screen TVs with digital cable, private backyard and spacious deck. Come, stay awhile, and enjoy some white hat Calgarian hospitality. Very clean, nice little features in the house. Would stay here again. Liked the layout of the upstairs. Liked the finished basement. Liked the quiet neighborhood. Liked the accessibility to other places in Calgary. Liked that we were able to comfortably cook in the kitchen for 7 people. The beds were not super comfy. Thank you for staying with us and we are thrilled that the home worked out for you and the group! Kitchen very well stocked with tools and utensils...which is a good thing cuz I love to cook! Home very clean...immaculate ... loved that. Neighborhood quiet with lots of HUGE trees and great walking trails near by. Check in easy ... Joy and Vincent are great hosts...highly recommended! We'll be back. Hi Jason. Thank you for choosing to staycation with us and glad that you and your wife were able to spend some quiet time together in and around the home. We are happy that the local parks and pathways worked out well for your walks! My family and I had a great time! The house was in a great location for "base camp". We saw some great sites and had new adventures. Thank You! Hi Teresa. Thank you for visiting and staying in our home! We appreciated hosting your stay. Best wishes to you and your family. Very clean & functional for families of all ages!! We found the house to be very well laid out, clean and had a nice backyard to sit out in the evenings. It is close to many stores including grocery etc. We had a toddler in our family and the house was very kid friendly , had everything a toddler might need including some books & toys. We were very happy with our stay!! Hi Gail. Thank you for choosing to stay with us as well as taking the time to post your review. Hi Sheldon. Thank you for taking the time to post your review. We do have high-speed internet service at the home, however the modem might have had to be reset, or the service provider may have been performing maintenance work. We will typically ask our guests to connect with us if any questions or concerns such as this do arise! Although we do not have A/C, as highlighted in our home description, we do have the fans in each room, if/as required. Thank you for staying with us and best wishes to you and the team! 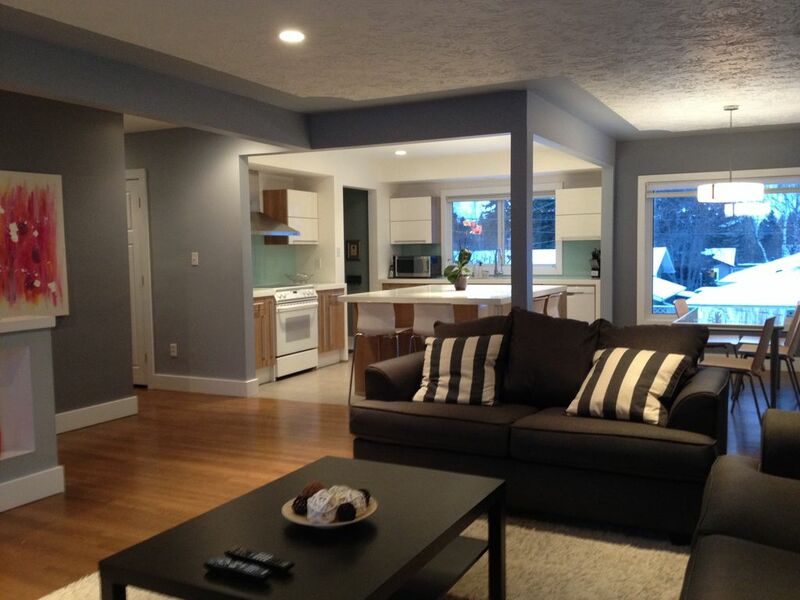 Located in the central community of Charleswood. Close to the University of Calgary, SAIT, Foothills Medical Centre, Alberta Children's Hospital, and downtown Calgary. All within a 10 min drive or less. Calgary public transit within walking distance.